Here’s the place to create poems, stories, memoirs and creative bursts assembled from words and phrases you’ve collected or that have been left here by others. But I can’t get to playing with them right now. What I need is a computer equivalent of the little scraps and notes I have in my files. I’m glad they resonate with you — thanks for letting me know. I’d love to see anything you come up with, if you find the time. Find some words and phrases you like. Places to search for these: inside the books on your shelves, in magazines or newspapers, on the Internet, out of the mouths of people near you, from your favorite poems, anywhere else words lurk. Or grab some from my word pile above. Take phrases from several different sources if that feels right. Piece your found words and phrases together in any way that appeals to you to create: a dreamy paragraph, a prose poem, a poignant line, a silly sentence, a haiku, anything that catches your fancy. Feel free to add your own words as you write. Don’t judge yourself. Be as silly as you want. Pretend you’re a little kid playing one of your favorite games. Paste wings on your words and see if they fly or if they crash in an impressive explosion. Most importantly, make sure you’re having fun while doing this! She notices yet another leathery over-tanned man. His accent stands out and reminds her of an all too familiar tense drama. She transports herself to another place and elsewhere it’s a different story. The long haired caftan wearing woman rummages in her box of fish shaped fruit flavoured candy. Each one another divinity icon. Great piece, Heather! I’m glad you had fun writing it, and thanks for sharing! this is the best I can do, and I used every single one of the words in my cavernously empty “search engine results” list. And added: I daydream, when gripped with, I’m no, nor, just and with clanging. Sad. And I have no words left for a title. Love it! I also love the fact that “poopybutt” brought someone to your blog…thanks for sharing. Don’t think too hard about this exercise. Don’t take too long. Don’t be too serious. Feel free to write something very silly. Enjoy the feeling of the words rolling through your mind. Play with the phrases that arise. I blink awake, recognizing the ecstatic singing of my fixated Muse, a persistent three AM call to create as he dangles my current task in front of my sleepy eyes: to write the tantalizing tale of a man with tiny feet consumed by a jungle of melancholy. Collect 16 words during the day. Find them on signs, food and clothing labels, junk mail, bumper stickers…wherever words lurk. Use these gathered words to write about your day in any way you choose—realistically, impressionistically, fictionally. It could be a journal entry, a poem, a scene, a movie trailer review of your day. Write about specific events, or discuss your thoughts, dreams, an alternate reality version of today….Get creative! 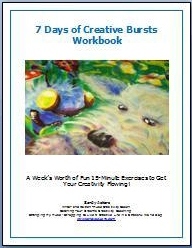 It turned out that creativity is about : Ability + Awareness + stayingpower(or Stamina. The grappical description shows a triangle with awareness on top and ability and stamina in the downcorner. MEANING that most of our creativity can be found on the SURFACE of this triangle.Tis process is called CONCEPTUAL BLENDING. Also see http://www.brandtcorstius.eu about this. Interesting — thanks for sharing this, Guido! Awareness (Aw) + Ability (Ab) + Stamina (St)–> F = Aw + Ab + St . => and all will differ in Time T + Place P + Group G.
Awareness and Stamina we can teach.